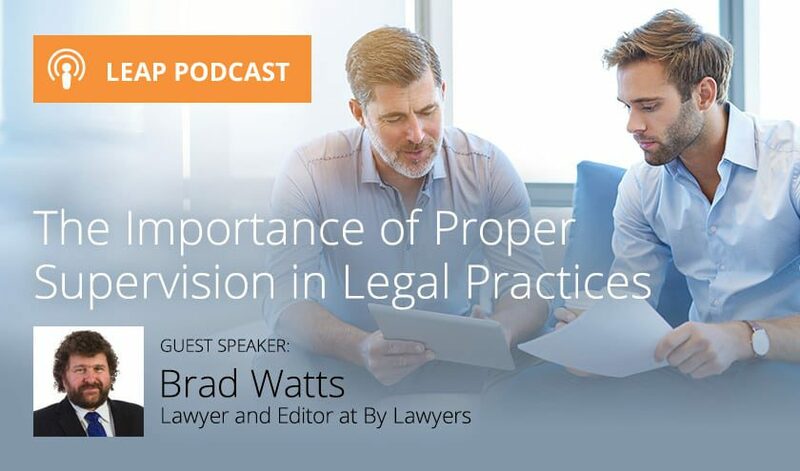 Claire James from LEAP and Brad Watts from By Lawyers talk about the importance of proper supervision in legal practices and how By Lawyers guides and precedents can assist firms in that regard. CJ: Hello and welcome to the LEAP podcast, I’m Claire James, National Marketing Manager at LEAP Australia. I am here with Brad Watts from By Lawyers to talk about the importance of proper supervision in legal practices and how By Lawyers guides and precedents can assist firms in that regard. Hello Brad, and what prompted this topic? “Proper supervision, mentoring and ensuring the quality of junior solicitors’ work requires considerable time and effort, as well as training and education, on the part of senior practitioners. It is critical that principals of law practices establish and adhere to effective management systems, policies and guidelines to ensure compliance with their statutory responsibilities under the Uniform Law. Proper supervision of legal practitioners who are subject to Condition 2 on their practicing certificates (the Supervised Legal Practice Condition) is good risk management. CJ: Hmm, that’s pretty serious Brad. the period while they are on their ‘L’ plates. They may have learned the theory, have read the road rules and observed as a passenger, but only by actually driving under close supervision of someone experienced can they really learn the practical skills. The requirement for junior lawyers to be supervised for the first two years of practice is basically the same thing. We don’t let inexperienced doctors see patients without supervision, we don’t let inexperienced lawyers act for clients without supervision. CJ: So how does the supervision work? Mr Humphries mentions an obligation on senior practitioners? BW: Yes, there is an obligation in the profession on senior lawyers to train and supervise junior lawyers. That’s a very important part of the way our legal system works. There are plenty of cases confirming that obligation and the NSW Court of Appeal has held that where a solicitor is employed by another, the client’s retainer is with the employer. That makes the supervision of employed solicitors not just a management issue, but a risk management issue.